Being able to put everything aside, kick back and have fun, is one of the most important talents that a person can possess (my opinion). If you haven't mastered this, no worries, it CAN be learned. This Wednesday evening, after a particularly busy and difficult prior weekend followed by a longer Monday, Tuesday, and Wednesday, I put everything aside and headed over to the new theater in my town, The Paramount. Aside from the fact that the theater is beautiful and being there for the soft opening made me feel like a rock star, the feeling of leaving everything behind and spending time with my husband, my brother and his girlfriend, was incredible, and a much needed release. Rocking out to Rusted Root didn't hurt either! This started me thinking though... Spending time with friends and family, doing something that you enjoy, is better than any therapy. Better than dessert. Better even, than a day at the spa (yes, you read me correctly). All of this reflecting made me think back to my own wedding (which was not long ago). In the days leading up to the wedding, my husband and I made an effort to spend time together, doing just about anything. While it would have been completely easy to get swept up in insanity and just done "wedding chores". It was therapeutic to spend that time together. A friend of mine is very pregnant at the moment, and I now apply this line of thinking to her... It would be easy, to be wrapped up in baby, baby, baby, but she and her husband right now, are making many efforts to do things together. Spending time doing things that they may not have time to do together for a while. So, today's post centers around things that you can do before a wedding, before a baby, before a big move, before a big event, milestone, or any other stressful (while maybe joyous) occasion, that will take your mind off of life, even for a few hours, and let you remember the important things. 1) The most obvious way, while maybe not the most cost effective, to get your mind off things and focus on your loved ones, is a vacation. There are some great last minute deals to be found. Priceline, Expedia, and Kayak all offer searches for last minute deals based on where you live and where you want to go. 2) Another option is a cruise to nowhere. These are cruises offered by the major cruise lines during times when their ship is in port. The cruise leaves one day, goes out far enough to gamble, party, and sleep, and then returns the next day. We went on the Norwegian Cruise Lines, Norwegian Gem for a friend's wedding, and it was loads of fun. They offer one night cruises leaving out of NY and weekend cruises leaving out of NY, Boston and Miami. Prices run as low as $200 per person. 3) Let's start simple... GO OUT!!! If you have children, this means that you find a babysitter, and go out. See a concert if you like music, see a Broadway play, a musical in your area, or whatever interests you, but... GET OUT. Decide who it is that you will relax the most with, and make time to go out with them. It will be worth your sanity... trust me. 4) A little more effort required here, but not much... Go on an adventure. Nothing induces a clear mind like spending time outdoors in nature. There are many opportunities depending on your location, to have an adventure. Maybe you like skiing, kayaking, biking, hiking, ice skating, roller skating, white water rafting, whatever, get outside and go explore. There are even public parks in my area that have paddleboating. Whatever your fancy, do a little research and find an adventure that suits you. Kids love to be a part of adventures, so it's a naturally kid-friendly outing. 5) If you live in NY, have a sense of competition, adventure, and the desire to try something different, check out The Amazing New York Race. Described as part scavenger hunt, part obstacle course, you are sent on a mission through the streets of NYC, armed with a digi cam, tasked to use your brain, smartphone and team effort, to reach your goal. Sound like fun? I'm signing up ASAP!!! Imagine taking your wedding party on this as a "pre-game" de-stresser? LOVE IT!!! Just a few suggestions to get started, but the bottom line is that it's important to make time for the important things. Take time for you, spend time with those you care about, and enjoy it, by leaving stress at home. So, how do you de-stress, or enjoy time with your loved ones? Share with us!!! I'll take the best suggestion and add it to a future post. Also, click like if you plan to use one of these suggestions, and let me know which one! 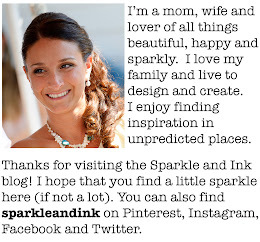 Enter your email to receive updates from Sparkle and Ink! We are so lucky to have such great customers! Sparkle and Ink since 2011. Simple theme. Powered by Blogger.